You see this is what happens when you keep saying ‘Yes’!  I thought I’d surprise you with another town team match report: yes, I am as surprised as you are that I was playing again – this time for Blackburn 1 team as they took on the mighty MidLancs 1 team. Before I said yes this time, I did have the foresight to check with Keith Ashton, Captain, that I wouldn’t be needed for ladies’ singles! So, on a very snowy Sunday afternoon I found myself catching up on the benches with the MidLancs team relieved to be watching the opening singles games. First up, Joanna Holt faced Emily Hollis for the away team. Despite Joanna’s protestations that she did not enjoy singles, she put up an excellent fight against Emily, only losing in 3 when the tactics were changed by the opposition and she began serving short. 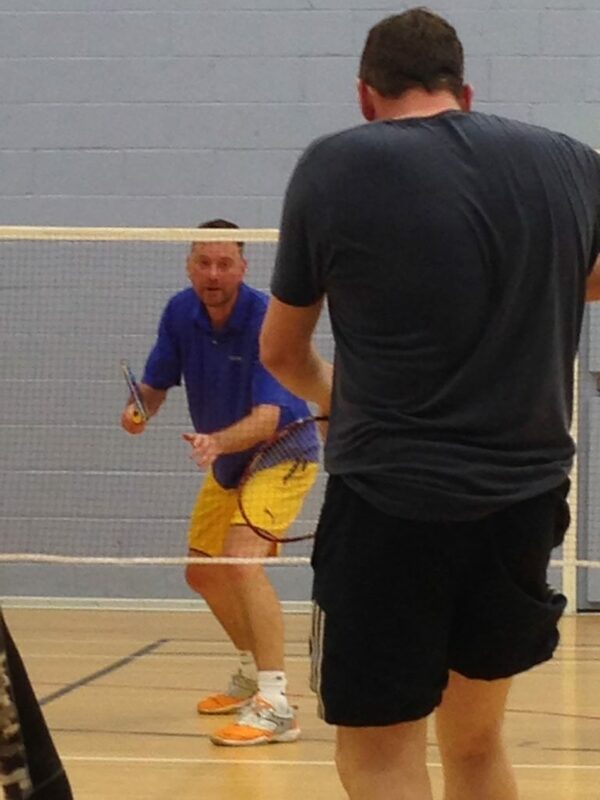 On the adjacent courts, the battle of the titans was in full swing with Phil Aspinall facing MidLancs’ Jared Matthews, and the prodigal son himself, Nick Hodgson, making a welcome appearance at second singles against Andy Owen, under the watchful eye of his Dad, Barry. Both Blackburn boys (I’m plenty old enough to call them that!) smashed mercilessly as they danced around the court, winning their games in 2. As the doubles’ matches commenced, Blackburn were up 2 to 1: the cliché ‘there was everything to play for’ began to be whispered by the non-playing Captain, Keith, as he hastily assured Nick that the glucose tablet which he’d just found in the depth of his badminton bag would not turn his super star’s legs a funny colour. Joanna Holt played at top ladies with Julie Bates against the MidLancs singles’ player, Emily, who played with Lizzie Holt. This was a real battle between the two couples, which the Blackburn girls were able to win in two, setting in the second. Yours truly was next up playing with Amy Ashrafi against Lizzie Balmforth and Karolyn Hustler. 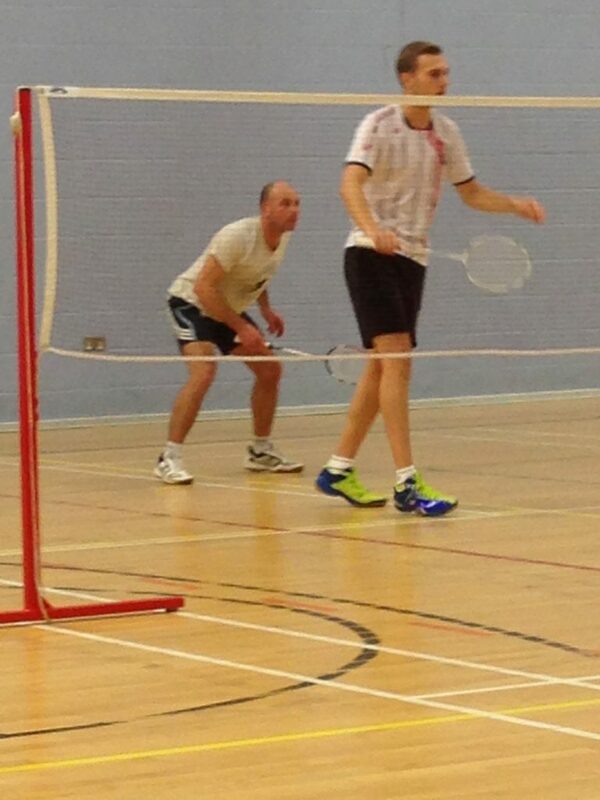 I was pleasantly surprised not to be picked on in this game (I did a lot of hiding at the net!) and, though we lost, the scores were a respectable 17. Using all four courts, we were able to keep the ladies’ games going and the pairings switched. This time, Joanna and Julie found a very different game to read when they met the number two ladies, and, like us, lost in 2. If only me and Amy had been able to emulate their score against the top pairing and secure that elusive point which was still dancing teasingly in front of Keith’s eyes. We did, however, put up another brave fight and played some decent returns from two talented young MidLancs ladies. 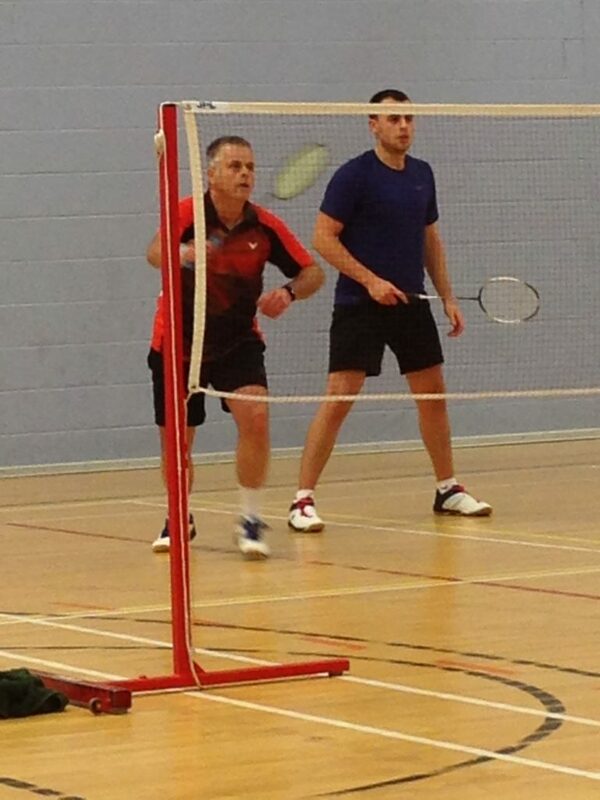 In the men’s doubles, the titans, Phil and Nick, had an exhausting game against young Jared and that gent of the MidLancs league, Steve Taylor. Having won the first game, their opponents came back to win the second, meaning that glucose tablet would be well and truly used in a third game. Having kept the decider neck and neck all the way through, the Blackburn boys just let the game slip right at the end. 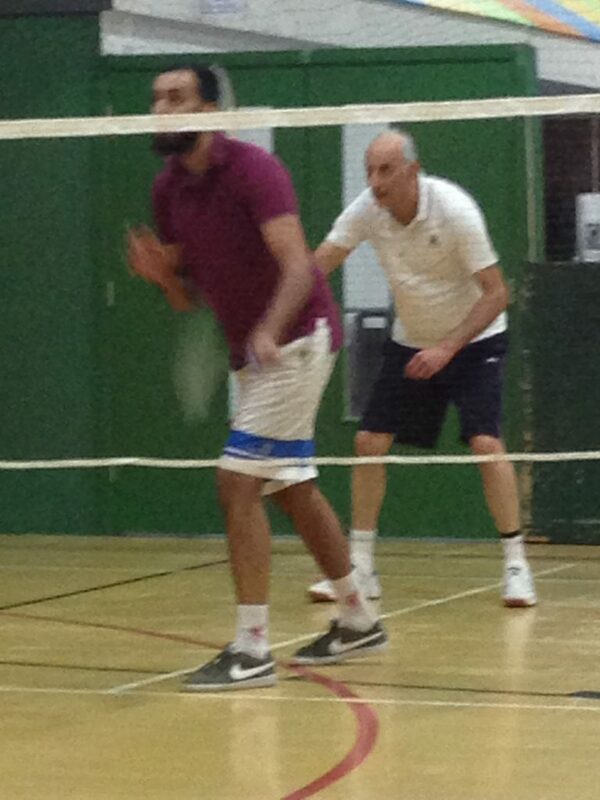 On the adjacent court, under the eager eyes of his two young sons, themselves desperate to get on to any empty court for a quick knock up, Sayed Majood partnered the ebullient master himself, Abdul Malik. 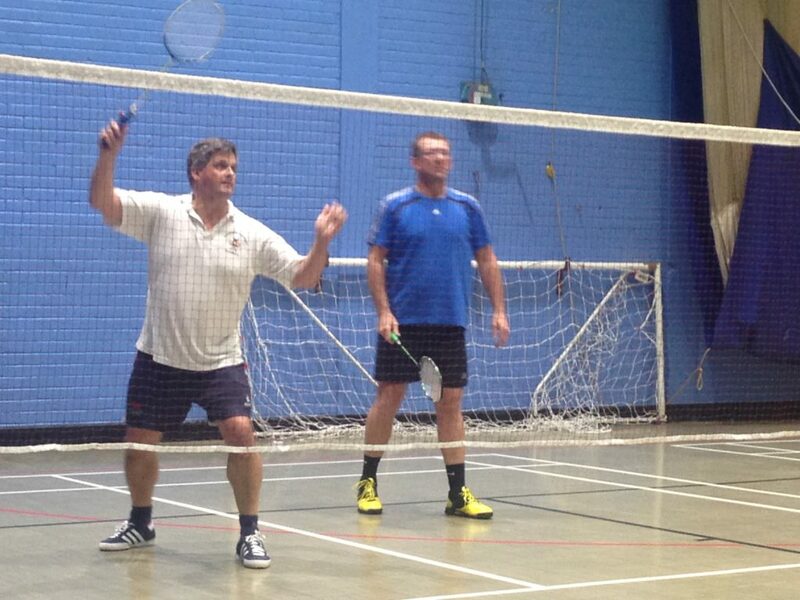 In their opening game, the Blackburn pairing met Andy Owen and Chris Hoyle. Sayed and Abdul were quick to take control of this game, forcing errors from their opponents with their tactical play, and winning the game in 2. As the men changed over, the match was still finely poised. Phil and Nick’s titanic strength produced another battle against Andy and Chris; this time, however, it was a battle that went our way, much to the relief of the home supporters. Sayed and Abdul had a tremendous tussle with the MidLancs top men, Jared and Steve, again forcing the match in to a three game decider. The opposition held their nerve, however, and the game fell to MidLancs. 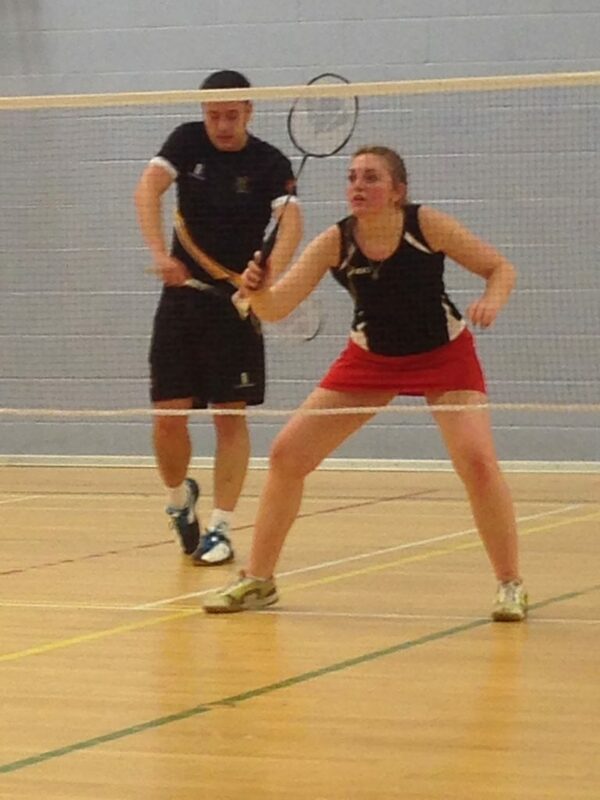 In the mixed doubles, despite only needing one game for a point, MidLancs dug deep and won all four matches. At top mixed, Nick and Amy faced Jared and Emily; followed by Sayed and Joanna against Steve and Lizzie H; with me and Phil at bottom mixed playing against Chris and Lizzie B. Our energy reserves must have been waning, however (either that or MidLancs were just a bit better at mixed than we were!) and we lost all of these matches in 2. As Sayed’s two young up and coming stars dashed on to the empty courts to show us what they could do (and, aged 7 and 6, they can do a LOT!) all of our hopes for that elusive point fell upon the shoulders of the experienced pairing of Abdul and Julie, facing the equally experienced Karolyn playing with Andy. This was the one mixed game we took to three, but, unfortunately, it was not to be and MidLancs ran away with a 10, 5 victory. All in all then, not how I had planned to spend my Sunday afternoon, but definitely something I enjoyed playing in. It was lovely to see so many friendly supporters there from both sides and to participate in a town fixture which was played throughout with courtesy and respect for all players. As chairs were found for me and the non-playing College Captain, John Bromley, the courts at Norden were already busy with social badminton players and team members knocking up ready for the match. The Telecom B ladies consisted of: Jodie Davidson, Victoria Baldocke and Gill Luker; they were to face Carol Yates, Julie Pye and Anna O’Grady for College. In the men’s, Rhys Holt, Luke Quigley and Nils McDonald for the home side would battle with James Aldred, Josh Lee and Will Pang. In the ladies’ matches, all four games were close and were duly split between the two sides. Using her strength from the back of the court, Jodie made sure Carol and Anna really had to work hard to retrieve the shuttle; this, along with some clever placing of the shuttle into the back hand corner of the court by her partner, Gill, resulted in two very close games. There was no let up in the second ladies’, however, which was just as close. After a hesitant start, the College pairing of Julie and Anna grew in confidence with the latter organising her tactics well on court. Young Victoria used her height at the net to her advantage, allowing Gill the freedom to run behind her. 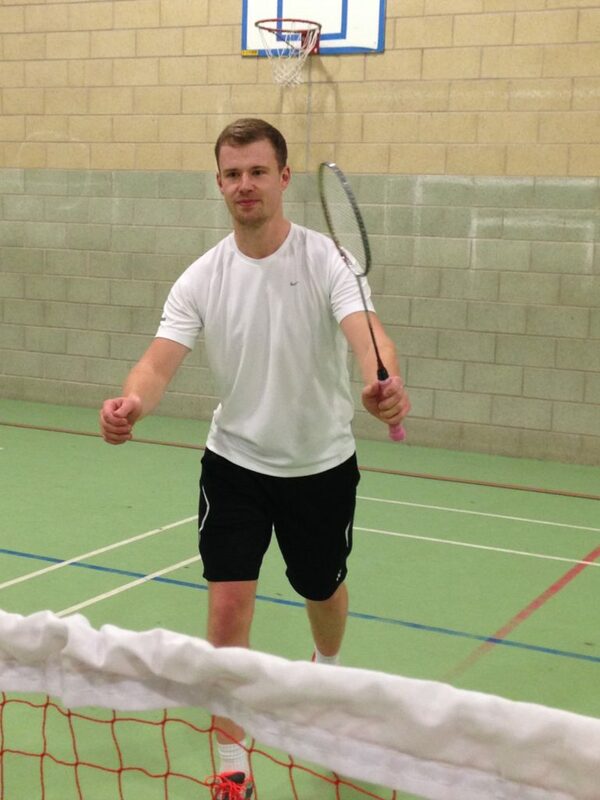 As the men faced each other, we knew we were in for more battles as the ‘dead’ shuttles began to litter the courts! In a very close first game between the home pairing of Rhys and Nils, the disguised long flick serve by Rhys was used to good effect. Intelligent placing of the shuttle, especially in his disguised drop shots, by James, and punishing smashes from Will for College, eventually wore down the Telecom gents. The second men’s game between Luke and Nils and Josh and Will, again was a pleasure to watch as all four men worked hard, frequently diving on the floor to retrieve a shot, and continuing to play from the floor in the case of young Luke! The energy of the away team pairing, however, saw both games again go College’s way. At top mixed, Rhys and Jodie faced James and Carol. Some steady serving under pressure from the College lady, coupled with excellent retrieval skills from Jodie, brought about another close match, which Telecom eventually won setting. 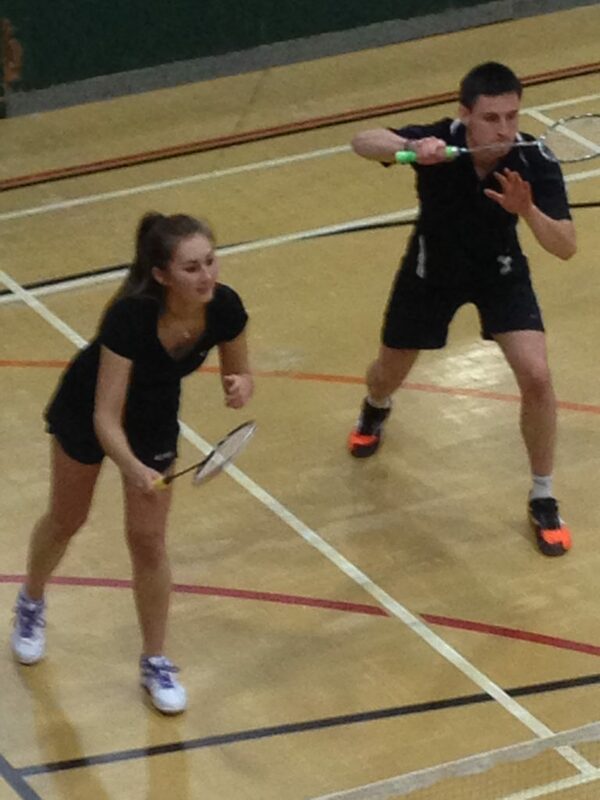 At second mixed, Luke and Victoria played Will and Anna for College in another very sporting game which could have gone either way. Will’s backhand cross court winners, however, proved difficult for the opposition to read, despite some very long and exhausting rallies. 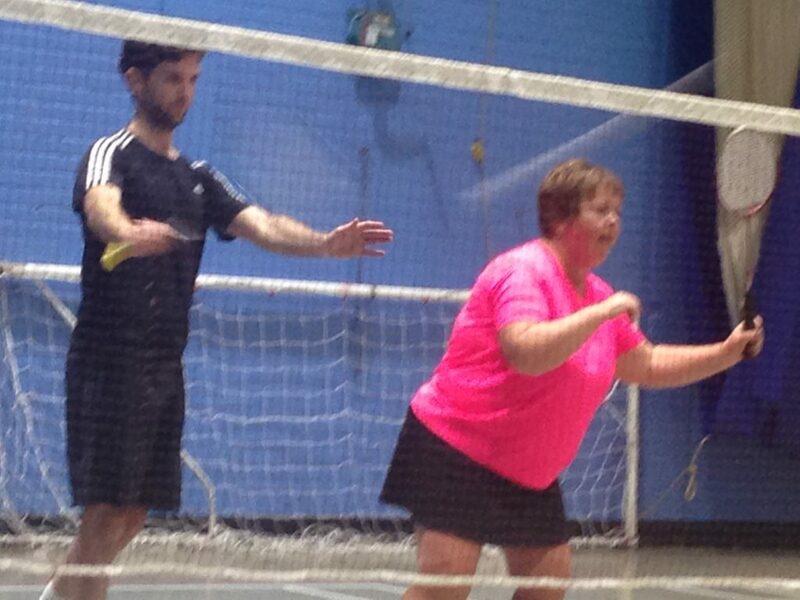 In the next mixed game, Nils and Gill found tough opposition in Josh and Julie. As her confidence grew in her long serve, Julie took control at the net, anticipating many of the wily cross courts thrown at her by Telecom. Quite rightly, however, this game was split between the two sides. 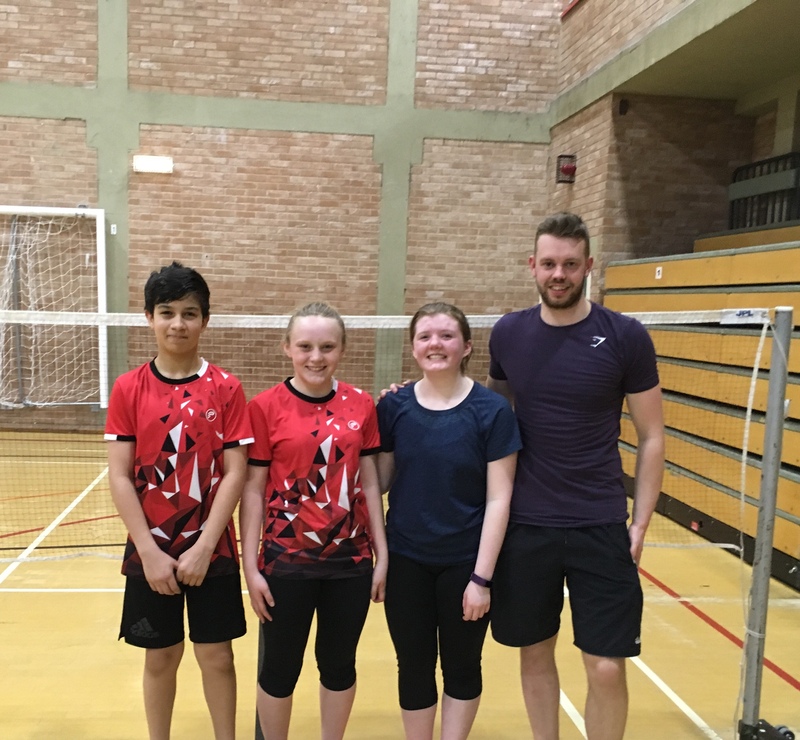 In the final games, Luke and Victoria for Telecom played the experienced James and Carol, whose support for their team throughout the match had been unstinting from the back of the court, watching. Both of these games went to the away couple although not without a fight by the young Telecom pairing. The final game went to the home team, however, as Rhys and Jodie saw off the challenge from Josh and Julie, despite much floor grovelling from the bouncy Mr Lee! All in all, then, a clear win for College, and yet with so many of the games so close, a match which could have gone either way. It was great to see the players’ enjoyment on court and their sportsmanship in congratulating good shots from the opposition. For a change, I thought I’d do a write up on a town team match, seeing as I was asked to play (must be desperate!) Late on Sunday afternoon, Blackburn 2nd team played Liverpool away at Holly Lodge Girls’ School. The team was a nice mixture of young and old: Cameron Holt and Luke Quigley, both of whom kicked the match off with their singles; Jodie Davidson (who had her arm well and truly twisted to play the ladies’ singles – thank you, Jodie) and young Lily Edmondson: for the oldies but goodies, there was yours truly, Amanda Hodkinson and the inimitable Pete Wright; I’m putting the final player, Matt Green, in the mighty and frightening group, as he well and truly scared the men in his doubles and at top mixed! Cameron got the team off to an excellent start with an easy win at top singles against Neil Rimmer. 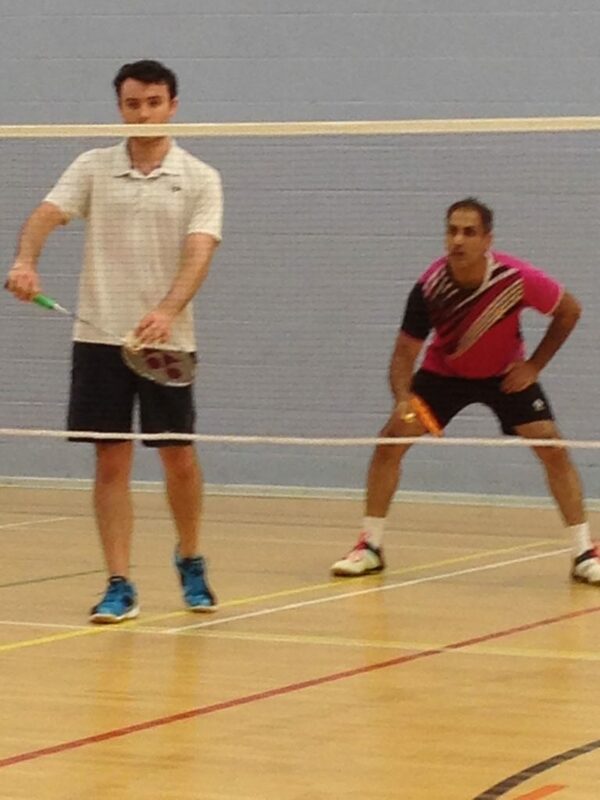 On the adjacent court, young Luke had a brilliant battle against his Liverpudlian adversary, Rajith Rajoli, eventually losing out in three games. Jodie battled hard against an up and coming star for Liverpool, Jess Ho, whose promise and coaching were plain to see. In the ladies’ doubles, Julie Murray and young Jess proved too strong for both of our ladies’ pairings; against the second ladies, however, Mayling Tse and Wendy Ho, both Blackburn couples had a great battle – Amanda and myself winning in two, and the youngsters, Jodie and Lily, just losing out in three. In the men’s, the mighty Matt partnered Cameron, and won both of their matches comfortably in two. Luke and Pete fought hard in their games, getting to 19 in against both couples, but unfortunately just missing out. As we went in to the mixed, we knew it was a big ask, but, if we won all four games, we would have a draw. Unfortunately this was not to be, although all of the red faces afterwards were testimony that everybody had truly tried their best. We did win two of the mixed games, however – the mighty Matt carrying yours truly at top mixed (I don’t think I have EVER played top mixed in my life!) and the inimitable Pete, playing with Amanda, at number two. I know Claire Edmondson really struggled to field a team for this match (hence yours truly! ): if you are ever asked to play for your town and you’re able to play, remember, it is an honour, you’ll receive a free t shirt, so just say yes! In the opening doubles, Karen Lamb, playing at three for the home side, partnered Gill Fourie and then Pam Parkinson, against the energetic Jenny Brookfield, Westholme’s number 3, with the roving reporter herself and Lynn Hosegood. 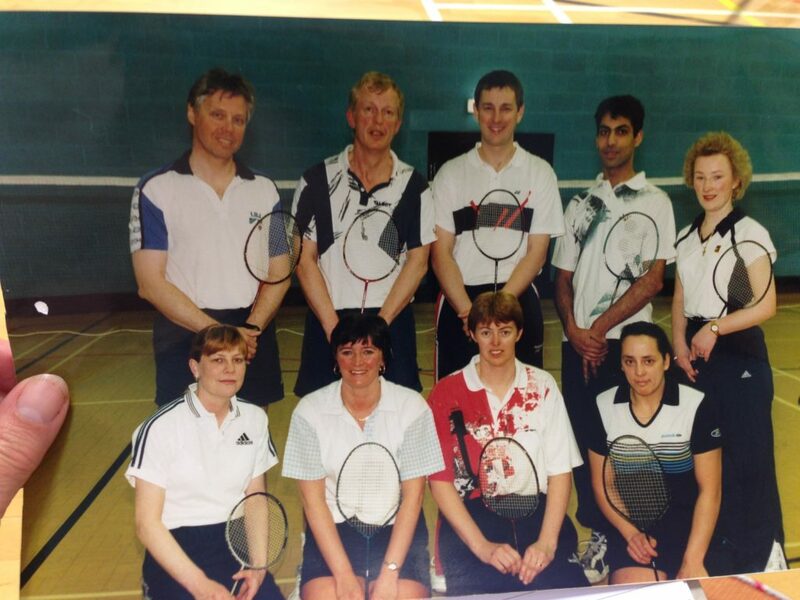 With strict instructions in my head to stay at the net (I’d given blood that afternoon and I was sure badminton was one of those ‘energetic’ things not to do within the next 24 hours) I basically let Jenny run herself ragged behind me as we faced Karen and Pam. After two very closely fought games, Westholme were two up. In the second ladies, however, the Independent partnership of Karen and Pam, were determined to pull something back. Having lost the first to Jenny and Lynn who had come from behind to win the first game setting, the home ladies secured the second game in another well fought battle. If the ladies’ games were fiercely competed, then the men’s were a battlefield (hence the title of this report!) First up, Captain Nigel Shuker partnered Stuart Davey against the Westholme men, Sam Ames, and the inimitable Graham Robinson. Point for point, the men battled hard, with some brilliant court coverage by all four gents. The away team eventually won both games, however, leaving one more men’s to play: Nigel and Pete Wright for Independents, against Graham and Sully. The first game was neck and neck as the men fired the shuttle (and a few words) over the net. After a feisty match, the home team had pulled back another valuable game, leaving the score 2 games to 4 as we went in to the mixed. The top pairing of Stuart and Gill found it difficult to retrieve the strong left handed smash of young Sam Ames. And, when Claire remembered to stick her racquet up for the occasional cross court, the away couple quickly romped to victory. 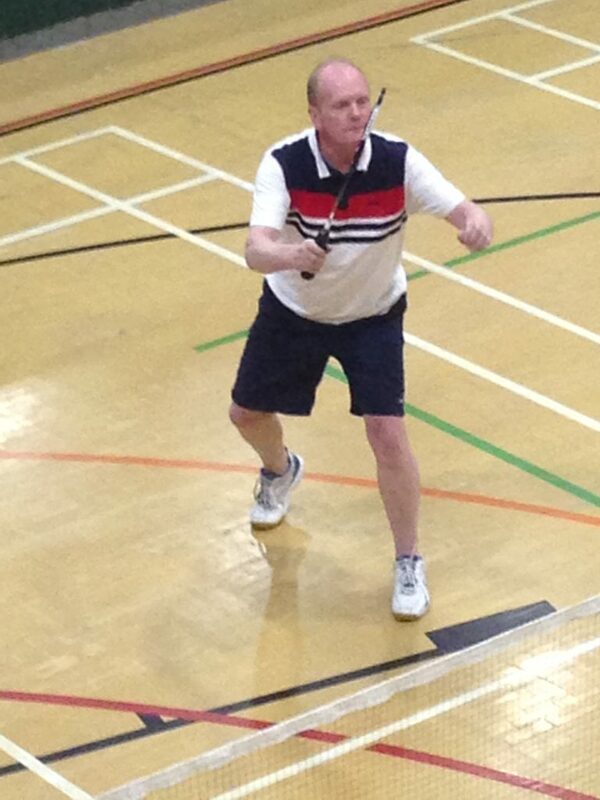 Pete at number 2 was ignoring his aches and pains as he dashed, with Pam, around the court against the Westholme partnership of Jenny and Graham. After a bad start in the first game, the away pairing caught up to win the first, but the knees and legs of the experienced Pete were not to be out done, and Independents had their third game of the evening. It was most unfortunate that, having recently returned to play from a chest infection, Karen and Nigel had to concede their game against Sully and Lynn when agonising cramp forced Karen to call it a day. In the final mixed games, Pete and Pam put up a brave fight against the might of Sam Ames as he dodged round his stationery partner; likewise, Sully and Lynn saw the demise of Stuart and Gill on the adjacent court. It was lovely to see the end court at Independents so well used by team and social players alike. Could this be one of those No Strings Sessions which the website might advertise for Independents I wonder? Please remember to support your league’s week of tournaments at Norden next week (yes, that’s why you’ve no match!) either by playing in one or more of the events, or going down to watch what will, I am sure, be exciting nights of competitive badminton. 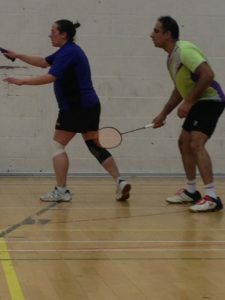 As Telecom B set up camp in the far corner of the court, Yvonne Kay, Captain for St Nicholas, welcomed her new signing, Gulfeshan Aslam, aka Shan, who would be playing his very first match in the league having last picked up a racquet 10 years ago! Under the watchful eyes of her father, Mohammed Aslam, aka Aslam, and with the gentle encouragement of all of the St Nicholas’ team, I watched the left handed Shan improve with each game he played. In the level doubles, Yvonne intelligently played herself at number 3, partnering first Lynne Barnard, and then Louise Hustler, against the young Telecom B ladies of Gill Luker at 3, with Jodi Davidson and Annabelle Baldock. Some impressive tactical play from the home team, playing doubles in the attacking front and back formation, brought all four games St Nicholas’ way. Clever disguised drop shots from the back by Louise kept the youngsters running, but it was the Captain, Yvonne, who really dictated the play with her astute reading of the game. On the adjacent court, Shan at number 3, was eager to take on the two Telecom boys, Rhys Holt and Luke Quigley, with the wily Nils McDonald his number 3 adversary. Up first, Shan and Gary Walton faced Nils and Rhys. Gary’s court coverage and tactical play were unstinting, forcing the Telecom men to work hard for their victory. Shan’s short serve and drop to the net became increasingly effective, along with the long flick serve which he occasionally threw in. In the second men’s game, the father and son partnership for St Nicholas took on the experience of Nils, this time playing with Luke Quigley. If ever a prize is given for courtesy and manners on court, then this young gentleman has got to be in the running for it. I have rarely heard so much positive encouragement for his partner and appreciation of the opposition’s good play from a player. Keep it up, Luke! By the end of the level doubles, it was still all to play for, and there were anxious glances emanating from the Telecom camp, still ensconced at the rear of the court. First up in the mixed, Lynne and Gary at top, faced the energetic pairing of Rhys and Jodi. Using the whole of her racquet, Jodi’s enthusiastic returns kept the rallies going throughout these games, both of which went to Telecom B. On the adjacent court, however, Louise and Aslam were having better luck against Gill and Nils, winning both of their games to bring the match back to all square. Shan, playing his first game of mixed, with Captain Yvonne, then faced Annabelle and Luke. This was a delightful match to watch in terms of both its sportsmanship and friendly competitiveness. Yvonne’s tactical awareness and Shan’s clever use of drop shot really meant the Telecom pairing had to work hard to win each point. 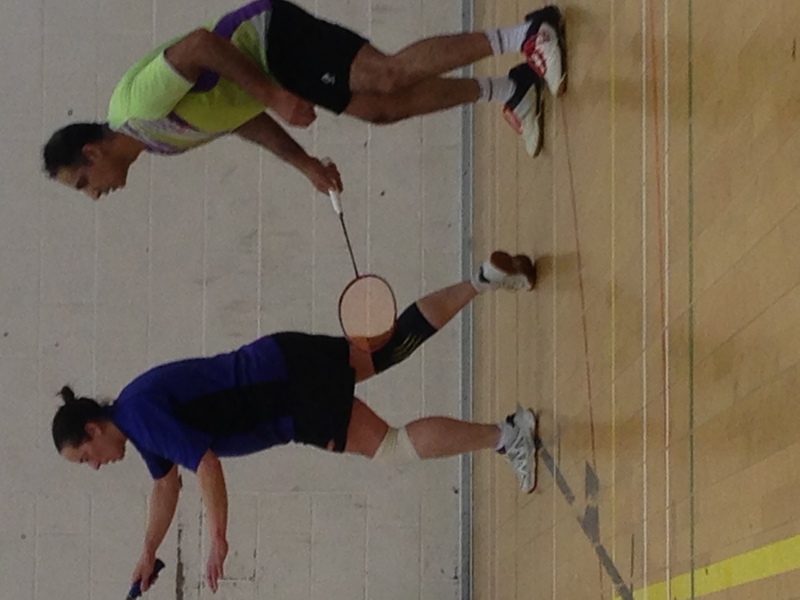 On the adjacent court, Dad, Aslam, playing with Louise, were having better luck against the youngsters, Jodi and Rhys. The home pairing could not have worked any harder, with Aslam using his height at full stretch at one point as he dived for the shuttle. Louise showed good aggression at the net, pouncing on the opposition’s returns, ensuring victory for St Nicholas in both games. And so, as the last couple went on court, it really was still all to play for. Facing Annabelle and Luke for Telecom, the first game went down to the wire as the red faces on court paid testimony to, falling in the away side’s favour. Telecom then went on to romp to victory in the final game, but, again, with courtesy and respect for their opposition who had worked so hard. An entertaining match from beginning to end, this really was a result which could have gone either way. Well done to Shan for his first game in the Blackburn league (wait until you’ve been playing for as long as me and Gary!) and also to Luke for his behaviour on court. After a very busy junior practice and coaching session (27 promising badminton players of the future) prior to the match, the Seniors A team, minus their Captain who was otherwise engaged treating his Dad to a delayed Father’s Day present, prepared to meet their adversaries, Telecom. They may have been without their main man, but the home team were under the watchful eyes of the main man’s mother who seemed to have instructions to go here, there and everywhere, once she’d put her massive box of shuttles down. As if this vigilance wasn’t enough, it was lovely to see the Edmundson clan out in force, looking so well. The Seniors A ladies, ‘thisgirlcan’ Jess Portas, Joanna Holt and Sarah Woodhouse, who played at 3, faced Jane Makey, Kath Spillane with Judith Hamilton at 3. The games were neck and neck, with some excellent rallies and court coverage. Judith unleashed the weapon of her centre line long serve, causing frantic retrieval skills from the home side. The young Seniors’ ladies, however, eventually proved too much for Telecom to handle, but not without Kath and Judith nicking a game from Joanna and Sarah. Experience has to count for something as they came off court and totted up the age difference between the two sides. On the adjacent courts, the Seniors A gents, led by the reinvigorated Nathan Whitehead, Matt Boyes and Olly Gregory at 3, faced part of the Holt family, in Cameron and his Dad, David, who played at 3, with Scott Heywood playing at top. Like their ladies, the Telecom men battled long and hard. All four games were extremely close and, again, the rallies were evenly matched. 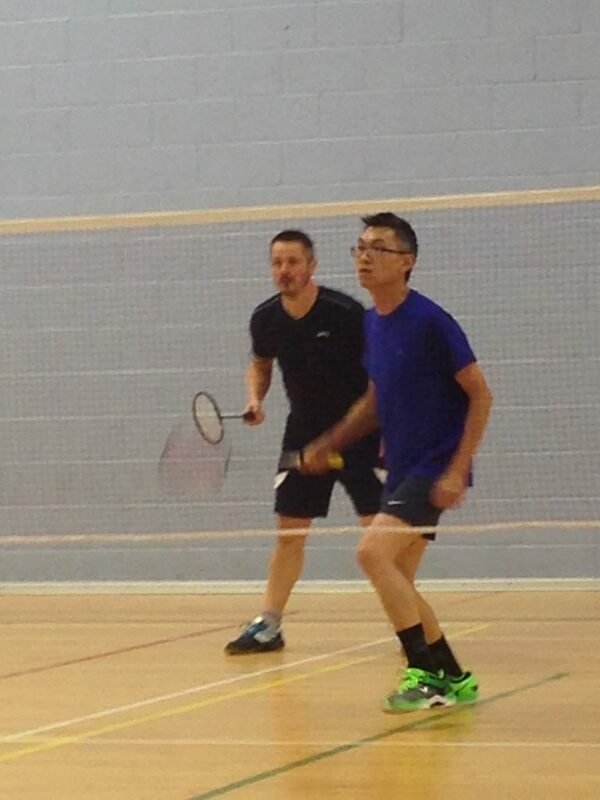 It was Olly’s well balanced coverage of the court, however, and Nathan’s punishing smashes, which eventually saw the home side take the men’s doubles. As the mixed games got underway, there was a welcome respite for the number 3 man for Telecom, David, as Jess and Nathan at top mixed played their opposite number, Jane and Scott. Two excellent games here saw some brilliant reaching of the shuttle from the ever positive Scott and delicate net play and coverage by his partner, Jane. The Seniors’ couple, however, blasted their way to 21 first. With fresh energy (and oxygen) behind him, David and Judith then met Jo and Matt for Seniors. Some excellent consistent serving by the home side forced mistakes from Telecom which not even Judith’s centre line serve could overcome. Next up, Olly and Sarah played Kath and Cameron. It’s becoming a bit of a cliché, but this was another point for point battle between the two sides. This time, however, young Cameron split the games, giving Telecom their second game of the night. As the final mixed games went on court, Jo and Matt for the home side played against Jane and Scott, followed by Jess and Nathan against Kath and Cameron: unfortunately for Telecom, the Seniors’ team had the bit between their teeth at this stage of the evening, and came away with the remaining games. The photo of the league table which the Telecom captain had taken prior to tonight’s fixture may have been short lived, but his team put up a very brave fight against a talented young group of players from Seniors A. A local match for me to cover this week between two very evenly matched teams: the home side led by the smiley Anniversary Captain, Nigel Holt, who played at one, assisted by Mike Nicholson and Dean Bertenshaw at two and three respectively; the Goodshaw ladies were Kath Gillam and Val Bertenshaw, with Lisa Archer playing at three. Their adversaries on the night, Abacus B, were Captained by Kathy Kier, who played at two, along with the experienced Julie Blackburn and Karen Cook; with the canny Mr Mick Crilly at one, assisted by Eric Duckworth and Paul Hooper, at two and three for the away team. In the opening ladies’ games, despite some excellent anticipation and determined court coverage from the Abacus ladies, the strength of Lisa Archer at three ensured a solid start for Goodshaw. In the men’s games, however, all four games were extremely close and well fought. It really was neck and neck throughout, with all four men battling to get to 21 first. It was lovely to see the keen as mustard Mick, coming back from a shoulder operation, covering the court as energetically as ever. 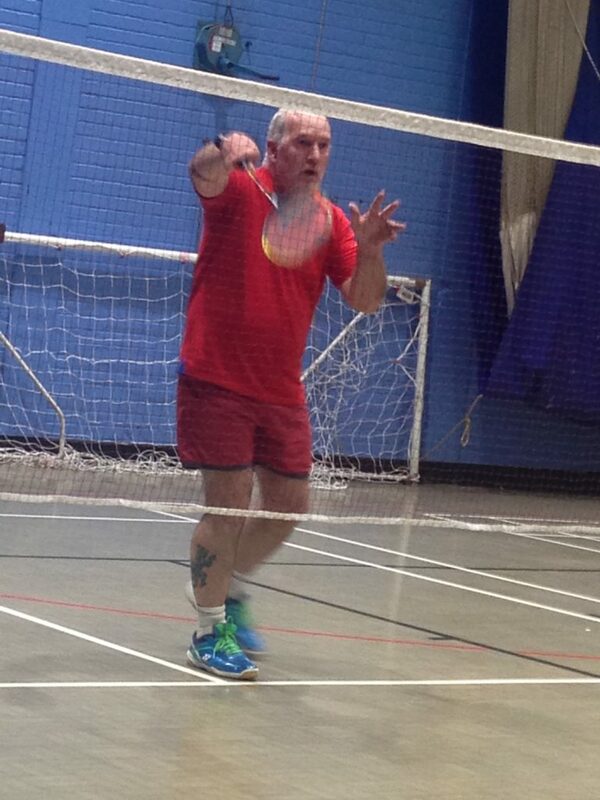 Delicate net shots and excellent short serving from Mike Nicholson for Goodshaw and strong centre line smashes from Dean meant the away men really had to work hard for every point. At the end of the level doubles, the home team were up 6 games to 2, with both men’s games split. 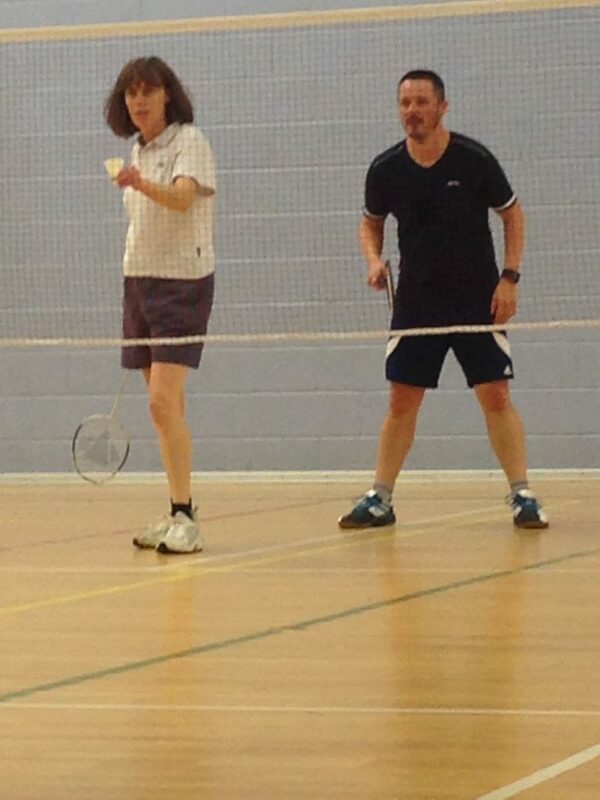 In the mixed doubles, the top pairing of Kath and Nigel, faced the tactical play of Julie and Mick for Abacus. There were many close rallies in this good humoured game with the away team winning both games. Nigel’s team seemed spurred on by their captain’s defeat, however, and the rest of the mixed games went Goodshaw’s way. 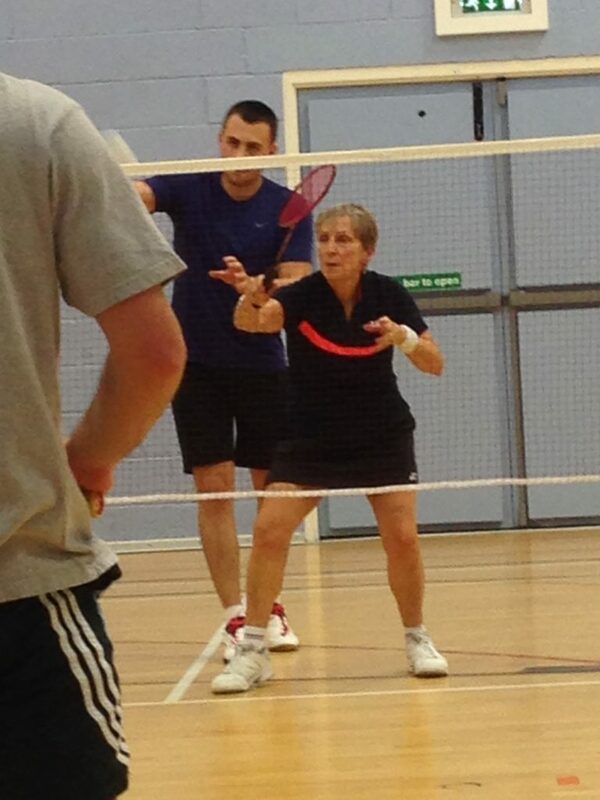 There was some excellent agility at the net from Val Bertenshaw who produced the shot of the night when she retrieved Mick’s smash with a cross court winner in two very close games against the top Abacus pairing. Lisa and Dean were equally effective in their mixed, played as a level game, when they took on Kathy and Eric, despite some punishing cross court shots from the Abacus gent. Despite the final score, this was a very evenly matched game, played with friendly competitiveness and good humour from start to finish. Tournament week is fast approaching, folks – your secretaries have received Claire’s email – so get thinking about who you’d like to enter with and make Rick Smith and his team of handicappers work hard on your handicap in singles, mixed and doubles! Still basking in the fright they had given to Blackburn Seniors A the previous week where they ended the level doubles 6,2 up before realising they must have peaked too early, the young pretenders, ably captained by Sue Hirons, warmed up in readiness for tonight’s game. Their other ladies, Laura Beard (soon to be Mrs Chris Whitwell) and her bridesmaid buddy, Olivia Lucas, two very competent players from Colne, along with Laura’s soon to be husband, Chris, skipping Jonny Bradley and Ian Bythell. The home team, captained by Mr Nonchalance himself, Keith Ashton, had Abdul Malik, multi-tasking a little crèche at the side of the court, and the promising Rees Parry, fresh up from the B team. The Hit and Miss ladies were Julie Bates and Cheryl Parry partnered by the sprightly Alison Leaver, that energetic left hander. In the first set of ladies’ games, the Caprica bridesmaids took an exciting game from Cheryl and Alison with Olivia’s thoughtful placing of the shuttle and deceptive flick clears forcing the home team to dig deep. Alison and Julie, however, proved too strong for the second ladies, Sue and Olivia, despite some excellent retrieval play from the opposition. In the men’s doubles, young Rees partnered the experienced Mr Nonchalance and multi-tasking Malik against the energetic Ian, playing first with Chris and then with Jonny. There were many long, exhausting rallies in all four men’s games, but the Hit and Miss men came away with all four games with Abdul producing the shot of the match, a beautiful cross court net shot. In the mixed doubles, Laura and Chris were so eager to take on Abdul and Julie that the games momentarily went out of order. Fortunately, this gave the exhausted third men, Ian and Rees, time to recover. The order of the games is something the committee will need to re-visit I think as whoever plays at three seems to have their games consecutively according to the score sheet. Keith and Cheryl took control at top mixed against Chris and Laura (soon to be Mr and Mrs), but the away team snatched another game against Alison and Rees where Sue and Jonny’s tactical format proved highly successful. In their second mixed game, this time against Keith and Cheryl, Captain Sue finally realised the opposition were fallible. Despite Mr Nonchalance reaching shots which at times seemed to be out of his bottom drawer, the excellent drop shot winner from Jonny split the games. The experienced partnership of Abdul and Julie, however, proved too much for Olivia and Ian, despite much court coverage from the Caprica pairing. So, a well fought and competitive match with some excellent play from both teams. Good wishes to Laura and Chris for their forthcoming wedding. 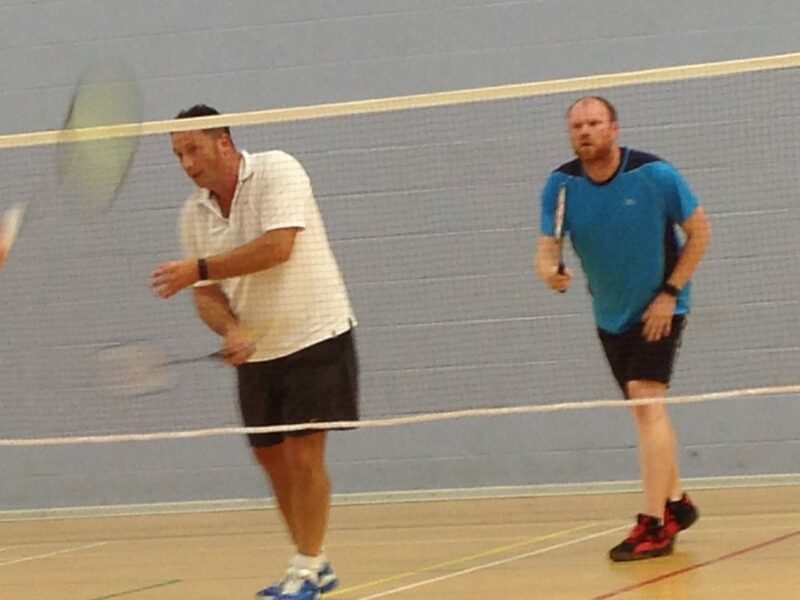 Oh, the ‘dirt’ promised in the title: they met on court (this is why badminton is so good for you!) when Chris hit Laura in the face with the shuttle. ‘Was she on the other side of the net I hear you ask?’ No, she was playing with him and foolishly turned round at the wrong time. Enough said…apart from ‘and they lived happily ever after’. Tonight’s pictures include a blast from the past courtesy of the Hit and Miss Captain: the 25 years on the trot winners of the League, the YMCA A team!